What dogs shed the least? Or don’t shed at all? Which dog breeds shed the least? Which dog breeds don’t shed AT ALL? There are hairless dogs, dog breeds that shed the least, and dogs that need minimal grooming. If you love dogs, but have allergies, you’re in luck, as there are quite a few dogs that have hypoallergic coats. If you love dogs but loathe the idea of picking up dog hair daily or shudder at the thought of constant grooming, pick a pooch that’s a minimal shedder. The African-bred Basenji tops on our list as a breed that both doesn’t bark AND are light shedders. Chinese Crested are as famous on the internet for their unique ways, and their on-point hair styles. These dogs are definitely unique–and we wouldn’t have them any other way! No hair, don’t care! For those who want hairless dogs, just remember, since they’re alls kin remember to put sunscreen on them! They can definitely get sunburn. The Ecuadorian Hairless is Vvry similar to the Mexican Hairless (also a dog with no coat) so make sure you take care of their skin needs! Another of the bald dog breeds, they’re sweet and very friendly. Once a companion to monks, these wookie lookalikes are minimal shedders. Resembling snowballs on legs, this breed was trained to catch rats in the Medieval Ages. Now, they’re often found nestled on human laps worldwide. Their coats are hypoallergenic, but they do need to be brushed daily. The most ubiquitous of all the small dog breeds, the Yorkie is a minimal shedder with a big attitude. They were, after all, bred initially to hunt rats and other vermin. This breed stands nose and ears above the rest when it comes to dogs that shed the least. Known for their curly, soft, hypoallergenic coat, poodles are also odorless! You’ll never have to deal with that eau de wet dog scent. They come in three sizes: toy, miniature, and standard. They don’t shed very much but they do need to have their coats clipped on a regular basis to prevent matting. Many Poodle hybrids like the Labradoodle, Cockapoo, Goldendoodle etc., are also minimal shedders and hypoallergenic. See above note about Poodles, and apply it here. Yes, this seems counter-intuitive, but the Afghan Hound’s long flowing coat does not shed. However, to keep their locks movie-fresh, they need to be bathed and brushed once a week. When President Obama and his family moved into the White House, they chose Bo, a Portuguese Water Dog as their family pet. Since Malia Obama has allergies, Bo’s hypoallergenic, curly coat was a perfect match. However, this web-footed medium-sized breed does need regular grooming. The Plott Hound is the state dog of North Carolina. A medium-sized dog with a calm, placid demeanor at home, they’re also great hunters. Plotts have smooth, glossy coats that need little work and don’t shed a lot. 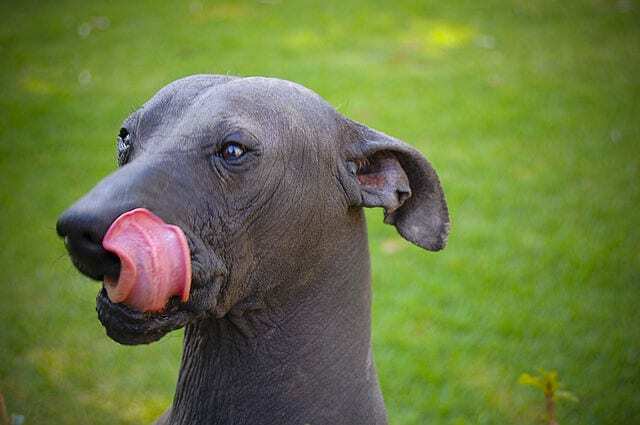 The Peruvian Inca Orchid (or Peruvian Hairless) comes in three sizes: small, medium, and large. They don’t shed at all, as they’re a hairless breed. That means of course that they do need sunscreen if you’re going to take them to the park. Airedales are super smart pups. They’ve been used to carry messages during both World Wars. They’ve also worked with police forces all over, and are loyal, protective companions. This English mid-sized breed is a low-shedder, but does need regular clipping to keep their dense, double coat neat looking.